Bill Denison Greg Bledsoe, an emergency room physician at Johns Hopkins Hospital, studies injuries from martial arts, boxing, and other combat sports. He also competes in Brazilian jiu-jitsu. "It's a little contradictory to do these research papers and participate in the sport, but it also gives you unique insight," says Bledsoe, who recently took his research team to an Ultimate Fighting competition in Las Vegas. "Most of these guys had never seen one of these matches in person. Watching ringside, I could give them insight into the facts and statistics they study." Bledsoe won his division in a Brazilian jiu-jitsu competition last year and trains several times a week at a gym near his home in Ellicott City. 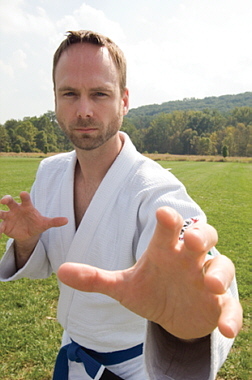 "The whole purpose of Brazilian jiu-jitsu is not to hurt people; it is to defend yourself," he says. He appreciates that the sport is not about being the biggest, strongest guy on the mat. "As long as a smaller guy is more refined in his technique, he can win," says Bledsoe, who at 6 feet and 165 pounds isn't exactly tiny. "It doesn't take a lot of strength and speed to do the techniques correctly."